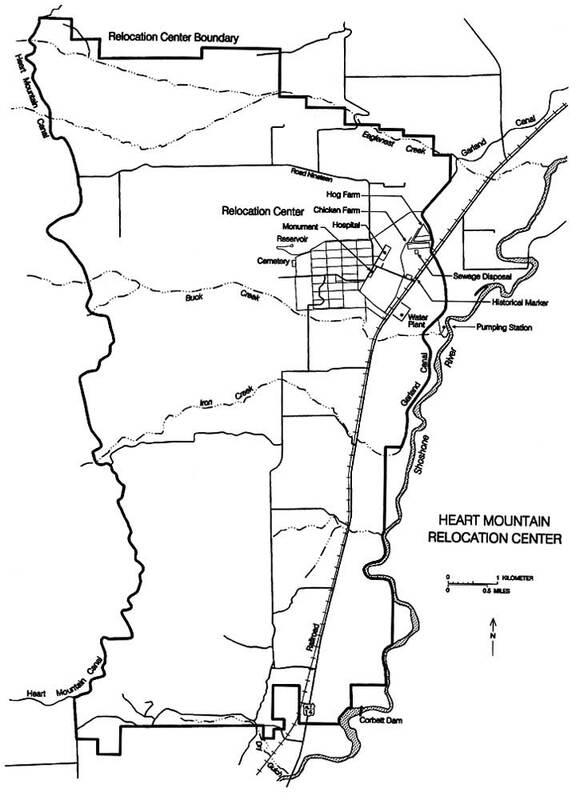 The Heart Mountain Relocation Center was located in Park County, in northwest Wyoming, 12 miles northwest of the town of Cody. Situated on terraces of the Shoshone River, the relocation center lies at 4700 ft elevation, within open sagebrush desert. Heart Mountain, a detached limestone fault block rising to 8123 ft elevation 8 miles to the west, forms a dramatic backdrop to the relocation center. The relocation center reserve encompassed 46,000 acres (Figure 6.1). The adjacent Vocation railroad siding and existing Bureau of Reclamation irrigation developments likely influenced the location choice; construction was begun June 15, 1942, with a crew of 2,000 workers. The first evacuees, from California, Oregon, and Washington, arrived August 11, 1942, and the center was in operation until November 10, 1945. With a maximum population of 10,767, the center was the third largest city in Wyoming. Local residents recall that it was one of only a few communities in the state to have electricity. Figure 6.1. Heart Mountain Relocation Center. Figure 6.2. 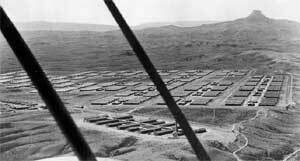 Oblique aerial view of the Heart Mountain Relocation Center. 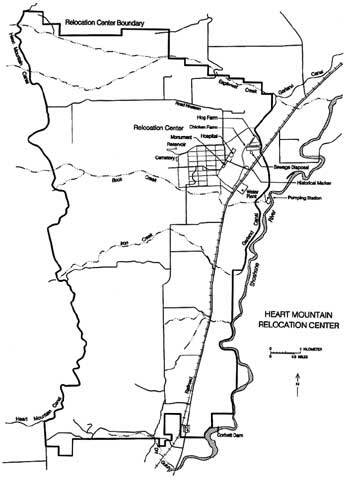 The Heart Mountain Relocation Center was a major part of the largest single draft resistence movement in U.S. history. To protest the unconstitutional confinement of their families, 315 Japanese Americans from all ten relocation centers were imprisoned for resisting induction into the military. Heart Mountain had the highest rate of resistance, with a total of 85 men imprisoned for draft law violations. The Heart Mountain total included seven leaders of the Heart Mountain Fair Play Committee who were convicted for conspiring to violate the Selective Service Act and for counseling other draft-age Nisei to resist military induction. In spite of substantial draft resistance at Heart Mountain, 700 men reported for their selective service physicals; of these, 385 were inducted, of whom eleven were killed and fifty-two wounded in battle.